53 familias están en riesgo de desalojo inminente de sus fincas en las afueras de Barranquilla para abrir paso a proyectos comerciales. No existen medidas para proporcionar compensación y, después de haber recibido amenazas de muerte, la comunidad está contando con apoyo nacional e internacional. Amnistía Internacional tiene una acción urgente para recoger respaldo internacional para los campesinos. En el calor del mediodía, un hombre levantó un manojo de muelles carbonizados tirados en medio de la finca el Tamarindo, una propiedad de 120 hectáreas al lado de la carretera entre Barranquilla y Bogotá. “Esto fue mi cama,” él dijo. Los otros restos de la finca que no fueron quedamos han sido empujados por excavadoras mecánicas para formar el montículo de cenizas en la cual el hombre estaba parado; un marco de silla roto, tubería, ladrillos regados, ramas carbonizadas de los árboles de ciruela y limón que él había sembrado. Una vía de tierra conecta Tamarindo a la Ruta del Sol, todavía delineada por un lado con árboles plátano, mango y ciruela, con matas de sandia y yuca, y con las granjas de madera que la rodeaban antes. Este pedazo de 33 hectáreas es todo que queda después de los tres desalojos ocurridos hasta ahora y actualmente está lleno con los campesinos despejados del otro lado de la vía, quienes buscaron refugio en las tierras de sus vecinos anteriores. July began with an intense period of training in which six potential FOR Peace Presence accompaniers explored the roles and responsibilities of human rights accompaniment in Colombia. The participants from Hungary, France, the United States, and Wales participated in a range of learning environments, from role-plays that recreated demanding situations experienced by past FORPP accompaniers, to audiences with FORPP partner organizations, and to exercises in thinking critically about human rights, power and privilege, volunteerism, and non-violence. 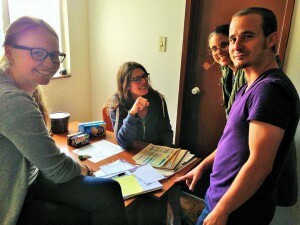 The training left all participants with a new understanding of relating to the issues facing Colombia, and with a new appreciation of the pleasures and demands inherent in working for international solidarity. Two participants then proceeded to complete further training to begin immediately as FORPP accompaniers, while another will join in November, and a fourth is volunteering in communications with FORPP with a view to joining as an accompanier early next year. 53 families face being imminently evicted from their farms outside Barranquilla to make way for commercial projects. There are no measures to provide compensation and, having received death threats, the community is counting on national and international support. Amnesty International has an urgent action appeal to garner international support for the farmers. 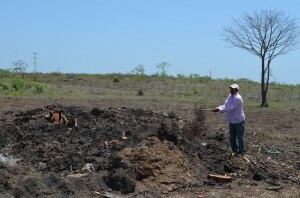 In the heat of midday a man lifted a bundle of blackened springs lying in the midst of the Tamarindo estate, a 120 hectare property alongside the Barranquilla to Bogota highway. “This was my bed.” he said. The other remains of the farm that hadn’t burnt had been shunted by earth movers to form the mound of ash on which he stood; a buckled chair frame, some piping, scattered bricks, blackened branches of the plum and lemon trees he had planted there. Beyond him the land stretched away into the haze, freckled with other mounds of the farms that had become established there for over more than 15 years. We’re grieving for our friends in Buenaventura. Recently, two young black lives were stolen from the community by paramilitaries. Christian, 15, was shot in the back while fleeing attackers who were trying to forcibly recruit him. Sol, 17, was fatally stabbed while trying to protect Christian. Why? Simply because their families refused to be silent, refused to allow their children to be recruited by the paramilitaries, and refused to allow their daughters to be subjected to sexual violence. 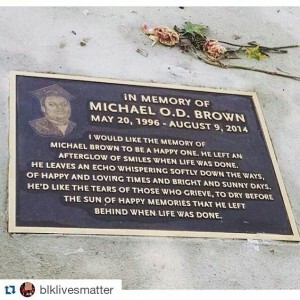 Here in the US, people took to the streets this past weekend to honor the memory of Michael Brown. We stand in solidarity with #blacklivesmatter, Million Hoodies Movement for Justice, BYP100 and the many other organizations in the U.S. and around the globe that aim to bring this issue to the forefront. We stand with the people who converged on Ferguson this weekend to protest and seek justice for Michael Brown’s murder. Whether it’s condoning brutality at the hands of police officers in the U.S. or paramilitaries in Colombia, the message from state agents and the illegal groups they work with, is clear: black lives are expendable. FOR Peace Presence recently expressed its concern regarding displacements in Buenaventura. Increased risks of displacements have been additionally denounced by community leaders of the neighbouring department of Chocó, as expressed in the following post, which has been originally published in Spanish by SweFOR Colombia. In less than a month, the civilian population in Alto Andágueda, in the Bagadó municipality, Chocó, suffered twice from the consequences of bombings carried out by the government’s military forces against the ELN guerrilla. These events have led to displacements, restrictions on mobility and property damage in the affected communities. The bombings occurred this March and April in the vicinity of the community of Piedra Honda and the Tahamí reservation in Alto Andágueda, causing damage to homes, and local confinement and displacement of more than 700 people in five communities in the reservation . It should be emphasized that it is not the first time the civil population of the reservation suffers the consequences of the armed conflict . 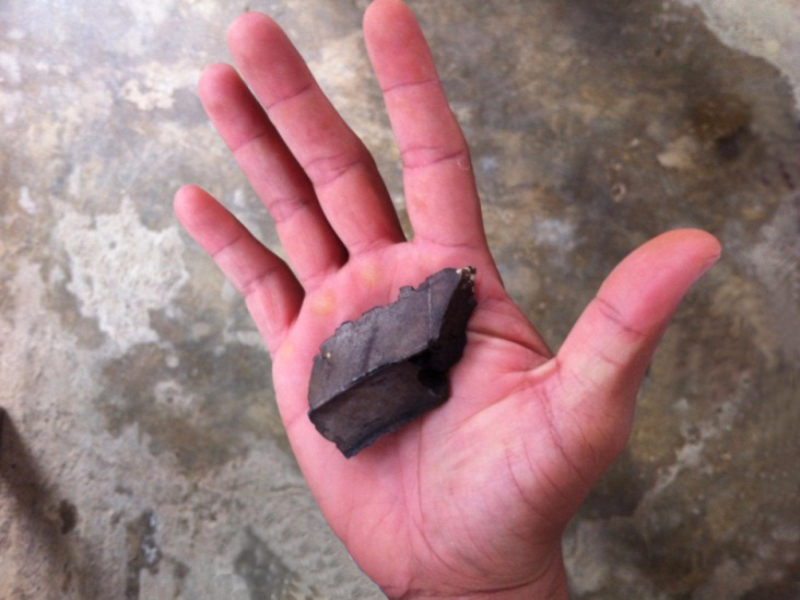 After the bombing, fragments of the explosive devices were found in the community of Piedra Honda.